I can't remember when the last time I did a favourites post was however I have decided this year I'm going to try and get all twelve favourites posts out on both my youtube and blog as they are some of my favourite posts to read and I love looking back on them at the end of the year. First off I wanted to mention bullet journaling, I have really stuck to it throughout January and have been thoroughly enjoying it. I have tried both the really simple bullet journal and the super complicated. At the moment I would say I am somewhere in the middle and I am enjoying it so much. If you would like a post about bullet journaling let me know in the comments as I'd love to do that. 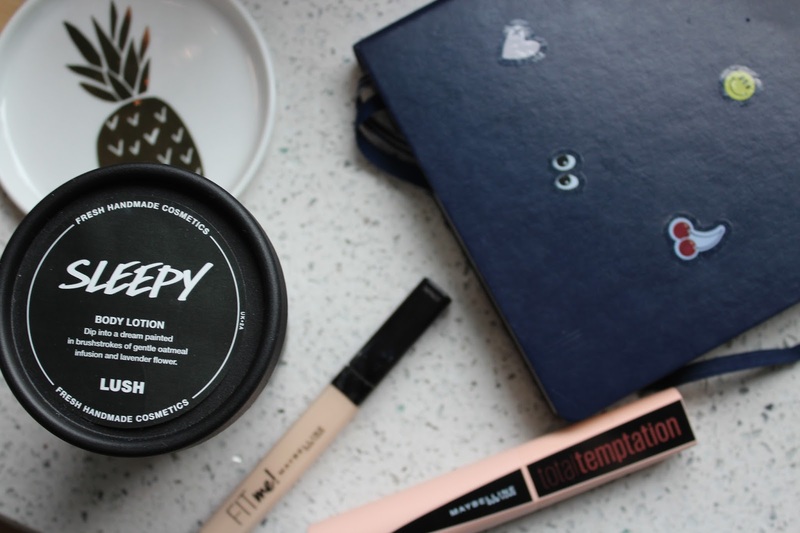 The rest of my favourites this month are beauty related, I wanted to mention Lush Sleepy as it is something I have been using all month. If you aren't a lavender fan then this isn't for you however I personally adore the way it smells. I'm not sure it actually helps me sleep however I do find it helps me to relax. 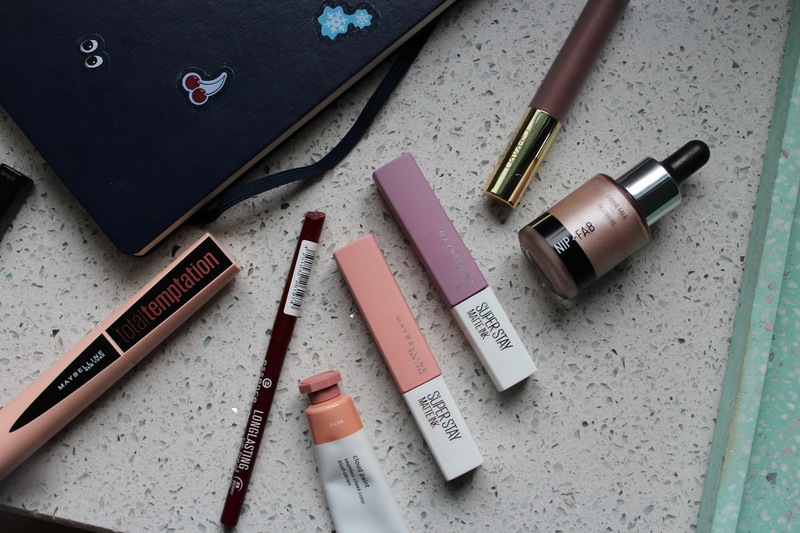 Moving onto makeup, for the face I have been loving the Maybelline fit me concealer. They have recently expanded the shade range and there is now finally a shade pale enough for my winter skin tone. Number 5 matches me perfectly and is actually pale enough to highlight under my eyes. This concealer is one I have loved for a long time, it reminds me so much of Urban Decay naked skin and is just a fab overall concealer for drier skin types. I got a load of Glossier stuff for christmas and without a doubt the Cloud paint in Haze is my favourite. It is a beautiful peachy brown shade which adds a slight peach flush to the cheeks which works beautifully with so many eye looks. The other item for the face I wanted to mention is the Nip and fab liquid gold highlighter in white gold. This is a beautiful pink toned highlight shade which looks so beautiful. This is definitely an intense highlight when used on the cheekbones however if it is mixed into the foundation it gives a stunning luminous look to even the most matte of foundations. Moving onto the eyes I wanted to mention the newest mascara from Maybelline, since picking up the Total Temptation mascara I have worn nothing else. I normally don't like a mascara straight away however I have fallen in love with this one. It lengthens the lashes and adds just enough volume. It actually reminds me a lot of Benefit They're real once it has begun to dry out. The other eye product is a liner, I have been looking for a deep red liner for ages however didn't want to spend a lot as I wasn't sure how much I would use it. However I have worn the Essence Long-lasting liner in Berry-fan-tastic so much this month. I have been pairing it with very warm toned grungey looks and I just love what it adds. I was a little worried it would make my eyes look sore however I don't find it does as long as it's paired with the right look. Finally for lips I have the Maybelline Super stay matte ink, I didn't pick out a particular shade as I have been loving pretty much all of the shades. I have every shade apart from 85 which I cannot seem to get anywhere. These are super highly pigmented and last forever on the lips. They aren't completely matte immediately however once they have dried down fully they are a comfortable matte. The shade range is also amazing, I would definitely recommend you check these out. Finally I wanted to mention the Gerard cosmetics Hydra matte in Iced mocha. This is something I have recently dug out of my collection and have fallen back in love with. It is a beautiful slightly grey toned shade. The hydra mattes are a lot more matte than the super stay ink's and are more like the traditional matte. So that's it for today, what are your January favourites? Those Maybelline lippys look fab! I’ve had my eye on those Maybelline liquid lipsticks! 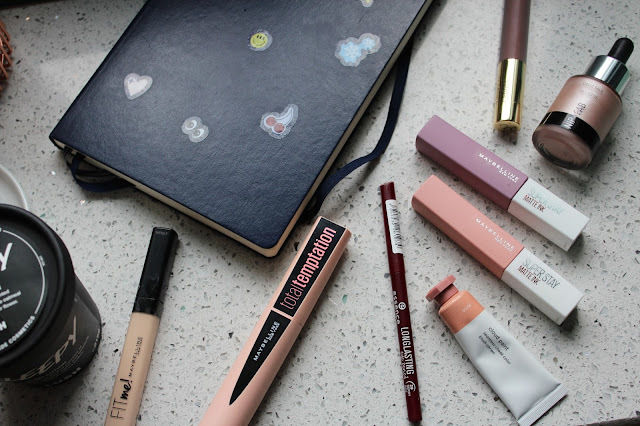 I'm such a fan of the Cloud Paints :) and I've been trialling the new Maybelline mascara too and so far, so good!